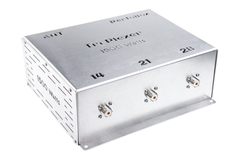 Sometimes referred to as combiners or splitters, these N-way plexers are basically band-pass filters, simultaneously passing RF in both directions through the common connector, while the filters provide a high degree of isolation between ports. TX and RX from two or three or four radios at the same time into a single multiband antenna. Allow a single coax run into two or three or four antennas at the top of the tower or separate in-band antenna site for advanced contesting, and few radios at the bottom, by using a N - plexer at both ends of the coax run, avoiding cost and weight and hassle of installing numerous coax cables.